This apartment on the first floor is part of a small and well-kept complex. Take a refreshing dip in the communal, kidney-shaped pool, after which you can enjoy the sun in one of the loungers. The apartment has a well-kept interior. From the living room you open the doors to the terrace, where a barbecue is waiting for you. From the terrace you overlook the pool and the garden. 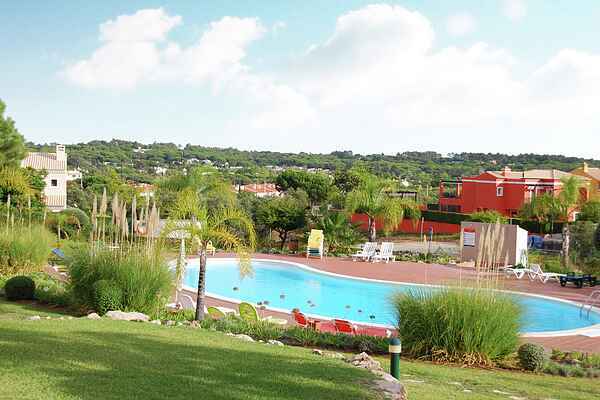 The entire apartment is air-conditioned.The apartment is located near the 18-hole golf club Millennium (1 km), a beautiful, varied course, located between the pine trees, where both novice and advanced golfer fully enjoy. The bus stops just 400 meters from your apartment and takes you to the seaside town of Quarteira (6 km). In addition to the kilometer-long boulevard, do not forget to visit the daily fish market (except Sundays). And what about a lovely day at the beach? In Vilamoura (4 km) you will find an elongated beach where you can take a boat to the sea. There are numerous boat trips organized along the spectacular rocky coasts.